Click “Forgot Password?” on the login page and submit the email address you used when registering your account. A new password will be sent to that email. Page Changes Monitoring (5 pages). To continue working with platform after the 14-day trial, you will need to subscribe to the service. To change your SE Ranking account login and password, go to Settings → Profile. Where can I find my paused projects? You will always see your paused projects on the main page. You can set them to Active at any time by changing the settings. How to migrate to SE Ranking from other services? You can import your keywords to SE Ranking from other systems that you have used in the past via our automated procedure of migrating projects with historical ranking data. If you’ve used a tool or a system other than Rank Tracker (SEO PowerSuite), contact SE Ranking support. Our specialists will manually import all the necessary keywords for you. 1. Open Rank Tracker and choose a project. 2. 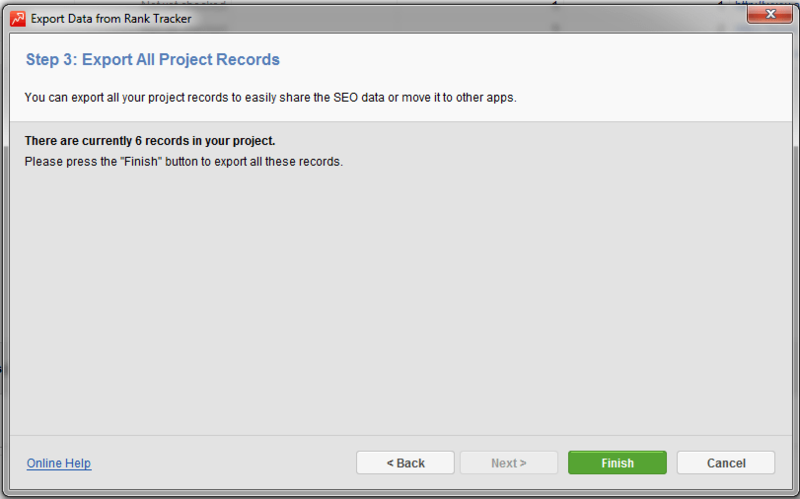 Export the project: File -> Export -> Ranking History. 3. Select CSV file type with decimal comma. 4. Select whether you need to export rankings historical data. Uncheck the box “Include competitors”. 5. Select the Search Engines you need to export the data from, press “Finish” button, then save the file. 6. Proceed to your SE Ranking account. Create a new project or go to the settings of an existing one. 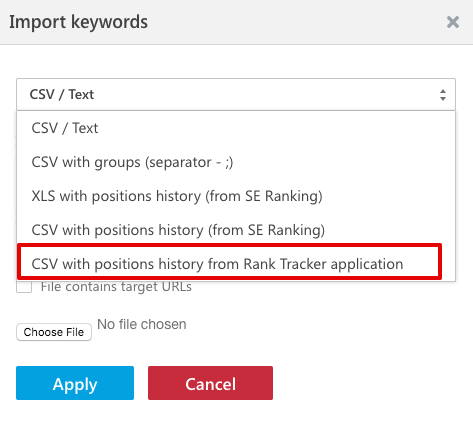 In the project settings open “Keywords” section, select an import option “CSV with positions history from Rank Tracker application”. Specify the regions that need to be assigned to the keywords. In case the regions that you enter are not present in the project, they will be added. Upload the file that you got from Rank Tracker. 7. Press “Apply” to add these keywords to SE Ranking. 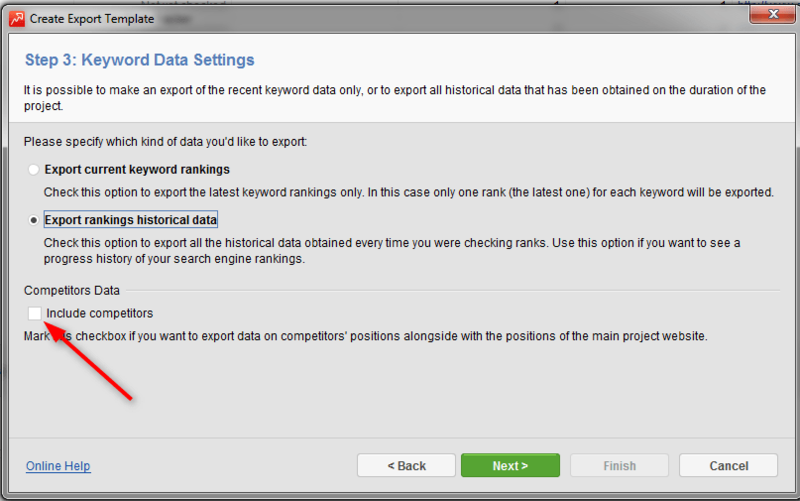 Once the migration is completed, the historical data for these keywords will be available under the “Rankings” section. Read more about how to add keywords to your project here. Can I customize my SE Ranking account? The White Label feature allows you to personalize the SE Ranking platform, making it look like it’s your own SEO software. You can easily customize everything in the system – logo, interface color scheme, reports. The platform will be accessible via your domain with no hint of or association with SE Ranking. White-labeling your service adds credibility to the relationship with your customers while building a community of avid users and brand advocates. The feature is available in our pricing plans – no need to purchase it separately. Can SE Ranking improve my website rankings? Sure, our SEO platform can improve your website rankings under the sole condition that you use all the tools and features we offer to boost your website performance. However, the improvement of rankings depends on your efforts and capacity. With SE Ranking, you can expand your semantic core, group your keywords, audit your website(s)to find all errors and check whether your website pages are optimized properly for certain keywords. You can greatly benefit from using our Marketing plan that provides step-by-step instructions on how to get ranked and stay in the SERP’s top. Additionally, you can control your backlinks profile to broaden it and remove all spammy links, analyze competitor backlink profiles and find new sites to place your links, research competitor organic and paid keywords to adjust your own, as well as check your website positions to track your SEO progress. Use our onboarding guide to start your SEO journey with SE Ranking, or schedule a live demo to learn how to navigate the platform. Subscribe to our blog to stay on top of all things SEO and online marketing, as well as to get important updates about our tools and services. How to set the location where I want to track keywords? You can select the search engine and location in the project settings, under the Search Engines tab. You can monitor rankings for a country, city or region. Just start typing a name of the city or a zip code in the corresponding field and choose what’s needed from the offered list. Up to 5 search engines/locations can be added to a project. More details on adding search engines and locations can be found here. How can I check the accuracy of rankings? The ranking results are taken directly from search engines. We store a cached copy of the search engine results received while checking the rankings. To make sure that each and every value is precisely correct, please click the value and it will bring up the cached copy. How can I recheck SE Ranking results in my browser? Use incognito mode. The search in the incognito tab does not take the search and browsing history into account. In Google Chrome, you can do this with the shortcut Ctrl + Shift + n or ⌘ + Shift + n for Mac OS. Use the Google Location Changer tool from SE Ranking. The locations you’re checking rankings for should be the same as the ones you’ve set in the project. If your current location differs, you can use the Google Location Changer tool. It allows you to see Google search results for any country, city, county, location, municipality and language. The complete list of factors that influence search results can be found here. Why do rankings in SE Ranking differ from the results in my browser? When you enter a query into the Google search box, the search engine will show the SERP according to your preferences and the topics you are interested in. That’s one of the reasons why the rankings you see while checking the positions in SE Ranking differ from what you see in the Google SERP. SE Ranking shows pure results that are not influenced by the user’s prior Googling history. Previous search history. To avoid getting personalized search results, you need to search in incognito mode. Location and browser interface language. Google shows results strictly based on the user’s location (the search engine determines it by the IP and location). To help users who want to see Google’s results for other locations, we’ve developed a tool called Google Location Changer. It enables users to see search results provided by the main search engines for any country, city, county, location and municipality. Just enter a query, choose a language and a location (an IP code, for example). All factors that can influence search results can be found in our blog. What is the difference between Backlink Monitoring and Backlink Checker? The Backlink Monitoring module allows to track the backlinks of your website and their parameters. You can manually add all the links, import a list from Google Search Console or any .CSV file. The status of all added links will be checked automatically every week. The Backlink Checker tool helps you discover the backlinks of any domain/URL, and, if necessary, analyze them against over 15 parameters. The tool works perfectly for the link popularity audit of any domain, including that of your competitors. How do I run a website audit? The website audit starts automatically when you create a new project. To restart the audit, click the appropriate button in the “Website Audit” module. Also, you can set up a schedule for automatic rechecks – once per week or month in the Settings. How much time does it take to generate a website audit report? Since your website is checked against dozens of parameters, we can’t predict exactly how long it will take the system to complete the audit. It depends on the number of pages and images on the website, whether there is a crawl delay in the robots.txt file, as well as the internal queue in the system. You will be able to monitor the crawling process in the Website Audit module. You will get a notification via email once the audit report has been generated. What is the difference between Website Audit and On-Page SEO Checker? The Website Audit scans all pages of a website and provides an analysis along with suggestions on how to fix identified problems. An example of the report can be found here. The On-Page SEO Checker audits a certain URL and evaluates how well it is optimized for a certain query. It detects mistakes that negatively affect the given page’s search engine ranking. An example of the report can be found here. How many additional users I can add to my account? You can add an unlimited number of sub-users to your account. This feature is available in the following subscription plans: Optimum, Plus and Enterprise. More details about subscription plans can be found here. How can I assign projects to sub-users? As an administrator, you can grant users access to particular projects and sections. You can specify the access rights under the “Users” section. Does SE Ranking have an API? Yes, SE Ranking has an API. It allows you to get access to almost all sections of the online platform. Plus, you can set up the API customization process with ease. The API is included in free trial accounts and in the Enterprise subscription plan. Are there any quotas for API calls? You can make up to 5 calls per second. We will disable access to the API for 10 minutes for accounts that regularly exceed the limit set on the number of requests that can be made per second. Can sub-users use the API? The API can only be used by users with admin-level access rights. It is not available for sub-account users. What is the expiration time of the access token? The access token will expire as soon as the user logs out. How long is data stored for in getTaskResults once results are obtained? The data received through the getTaskResults method is stored for 24 hours. Does SE Ranking generate scheduled reports? Scheduled reports are available under the Report Builder section. You can add every module to the report, personalize it by adding your logo and company name, and provide comments/explanations for each section. SE Ranking offers an affiliate program. Join our affiliate program and get a 30% commission from every sale. All you need to do is just log in to your SE Ranking account or create a new one. For more information, please visit our Affiliate program page. How can I sign up for the SE Ranking Affiliate Program? All you need to do is just log in to your SE Ranking account or create a new one. The Affiliate Program is available to all SE Ranking users. You do not need to register in any other system – everything is processed on one platform. Do I need to have a paid plan in SE Ranking to become an affiliate partner? The Affiliate Program tab is available in all accounts, both free and paid. You will have access to the Affiliate Program module even after you account expires. How much affiliate commission will I get from each sale? You will get a 30% commission from every sale. For example, if a user purchased a subscription plan for $100 through your referral link, you will get paid $30 in commission. Next, the user becomes your referral and all of his subsequent payments and rebills will bring you a 30% commission. How often is affiliate commission paid? We make commission payouts every 14 days, if the amount on the Partner’s account is no less than $50. We support various payment methods: PayPal, Webmoney or SE Ranking balance. Where can I see my sales statistics? We present all analytical details for you in your personal account. You can easily keep track of all transactions, the number of trial account registrations, unique visitors from your referral link, and sales revenue. All the statistics are updated in real-time with no delays. You can upgrade your subscription plan at any time. To upgrade, select “Subscription” in the settings and click “Upgrade a plan”. The system will recalculate the amount you need to pay extra, where applicable. You will see the final price on the checkout page. Does the number of keywords in the subscription plan refer to a single website or to the entire account? The total number of keywords is available for the entire account. Keywords can be distributed among different projects in any proportion. Each keyword can be checked in 5 search engines/locations within a project. How can I reduce the price of a subscription plan? You can reduce the price of a plan by choosing a longer subscription period. By getting a 3-month subscription, you will get a 5% discount; 6 months – 10%, 9 months – 15%, and the annual plan brings 20% in savings. You can also reduce the cost by changing the ranking check frequency to once every 3 days (20% off) or weekly (40% off) instead of daily. How can I buy a subscription plan? When you select a subscription plan, you will be transferred to the checkout page where you will be able to select a payment method and submit your payment through 2Checkout – our partner billing system. All payments are accepted via our billing partner 2Сheckout (ex.Avangate). There are more than 45 payment methods depending on the country including Visa, Mastercard, American Express, PayPal, Direct Debit, Discover/Novus, Eurocard, Wire Transfer, UnionPay and many more. If you can’t find an appropriate payment method, please contact our Support. Where can I find the invoices? All the invoices are available in your 2Checkout account. 2Checkout is our billing partner. Your login details are sent to you after the first payment goes through. If you don’t remember your 2Checkout account password, please reset it. How do I stop automatic recurring billing? You can disable automatic billing via your 2Checkout account. 2Checkout is our partner billing system. Your username and password are sent to you after the first payment goes through. If you don’t remember your 2Checkout account password, please reset it. Why was VAT added to my payment? All payments are made through our billing partner, 2Checkout. 2Checkout’s VAT policy supports the latest worldwide tax regulations. The list of countries where 2Checkout collects taxes can be found here. To avoid paying VAT, choose to make payments as a Company and add the VAT ID into a separate field. Where can I change the payment method? You can change the method of payment via your 2Checkout account. 2Checkout is our billing partner. All of your login details are sent to you after the first payment goes through. If you don’t remember your 2Checkout account password, please reset it. Where do I need to enter the VAT ID to exclude VAT from the payment? When submitting your payment, choose to make payments as a Company under the Billing Information section and add the VAT ID into a separate field. If you choose PayPal as your payment method, please follow these instructions to avoid paying VAT. Can I pay monthly for a subscription plan? Yes, you can make monthly payments for the Optimum, Plus and Enterprise plans. The Personal plan is billed annually only. More details on our subscription plans can be found here. It can take up to 40 minutes to activate a subscription plan in the account. Make sure you submitted your payment from your account or used the registered email address while checking out from the Plans & Pricing page. If you buy a plan from the Plans & Pricing page and use a different email (not the same one you used during registering), a new account will be created in the system. The login credentials will be sent to the email which was used for making payments from SE Ranking. Please contact our support team, if you want to transfer the plan from the newly created account to the one you initially registered. How can I pay for a subscription plan without VAT? To avoid paying VAT, you need to choose to make payments as a Company on the payment page and add the VAT ID into a separate field. If you choose PayPal as the payment method, please follow these instructions to avoid paying VAT. Please contact our support team to receive additional help with refund procedure. 1. Billing is provided through our partner 2Checkout and you can disable automatic billing in your 2Checkout account. 2. Username and password were sent after the first payment, if you don’t remember your 2Checkout account password, please reset it. If you need assistance with billing details or any other questions do not hesitate to contact our support team. 3. Email notifications about upcoming renewals are sent to your email 7 days before each renewal and they also contain instructions on cancelling automatic billing. What are the limits for the Page Changes Monitoring tool? Trial account users are entitled to have access to the Page Changes Monitoring tool and monitor 5 pages for free. If you want to extend the Page changes monitoring limits, go to the “Subscription” section and select “Extend the limit”. What are the limits for the SEO/PPC Competitor Research tool? SE Ranking users can benefit from using the SEO/PPC Competitor Research tool in all subscription plans. Trial account users can access 10 reports per day with 10 results per report (organic and paid results combined).